A replica of a Syrian monument, two millennia old and destroyed by so-called Islamic State in Syria, has been erected in London's Trafalgar Square. It will travel to cities around the world after leaving London. Syria's director of antiquities said it was an "action of solidarity". Unveiling the structure, London Mayor Boris Johnson said the replica was an arch of "technology and determination". He told spectators they were gathered "in defiance of the barbarians" who destroyed the arch in the city, north-east of the Syrian capital Damascus, last year. The original arch was built by the Romans. The two-thirds scale model will be on display at Trafalgar Square for three days before moving to other locations around the world, including New York and Dubai. 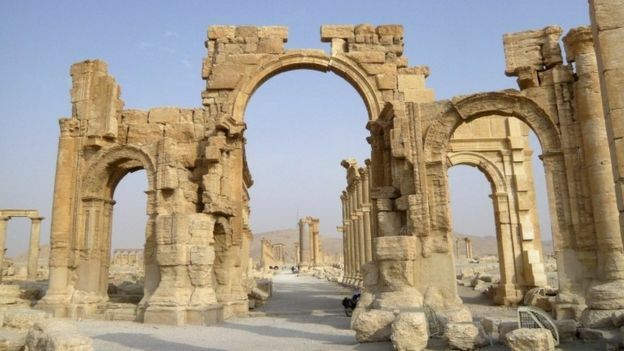 It is intended that it will then be taken to Palmyra next year, to find a permanent home near the original arch, said Roger Michel, executive director of the Oxford-based IDA. "It is a message of raising awareness in the world," said Maamoun Abdulkarim, Syria's director of antiquities who was in London to watch the replica being installed. "We have common heritage. Our heritage is universal - it is not just for Syrian people." Palmyra, and its complex of ancient ruins, was recaptured at the end of March, having been overrun by IS militants in May last year. At least 280 people were executed during their occupation of the city, according to the Syrian Observatory for Human Rights, a UK-based monitoring group. Mr Abdulkarim, who visited Palmyra a week after its liberation from the Islamic State group, also known as IS, Isis and Daesh, said about 80% of the ancient monuments remain.He stressed that the purpose of the project was restoration, using the new technology and the remains of the site to rebuild the ancient monuments, rather than creating them afresh. "We can never have the same image as before Isis," he said. "We are trying to be realistic. "But what we want to do is respect the scientific method and the identity of Palmyra as a historic site." Mr Michel said he wanted London to be the first to house the replica because the city itself had been reconstructed after World War Two, and that he hoped "anybody who appreciates free speech" would understand why it was so important to recreate the arch. Citing the economic importance of the site to Syrians, he said: "It doesn't mean because you mourn the loss of life that you should leave your country in ruins. No-one can bring back the dead, but you can improve the lives of the living." He added: "This is about censorship, in my opinion. If there are folks in the world who want to delete things from the historical record, they need to be restored. It's as simple as that. "This is not any different from book-burning. This is an attempt by folks to exorcise portions of history." But Professor Bill Finlayson, of the Council for British Research in the Levant, which supports research into the archaeology of the region, sounded a note of caution. "The publicity and so on is great," he said. "I have no problem with this [project]. "I think there is a bit more of a problem with the issue of reconstruction on the site itself. "The dangerous precedent suggests that if you destroy something, you can rebuild it and it has the same authenticity as the original." The installation of the replica, which cost about £100,000 to create, has taken place during World Heritage Week. Dr Robert Bewley, a specialist in endangered archaeology at Oxford University, agreed it was important the reconstruction did not diminish the significance of the original monument - and there would always be a "questions of value for money" of reconstructions. "But if wealthy philanthropists wish to create these symbols of the cultural heritage, to raise awareness of the destruction of identity and cultural heritage then that is their right," he added. Coinciding with the installation of the arch is The Missing: Rebuilding the Past, an exhibition claiming to be the first to "showcase the efforts of artists and scholars who resist the destruction of cultural heritage" carried out by IS.